Groudon's official artwork from Pokémon Ruby and Sapphire. Groudon (グラードン, Groudon) is a fictional creature in the Pokémon media franchise. Groudon is a Ground-type Legendary Pokémon and the version mascot of Pokémon Ruby and, in its Primal form, of Pokémon Omega Ruby. 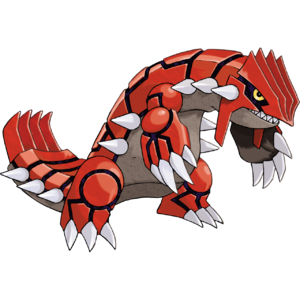 Groudon is categorized within the Pokédex at #383 as the "Continent Pokémon". It is the embodiment of landmasses, and its originally unique ability Drought is able to summon strong sunlight on the battlefield. Overheat is a special Fire-type move with 130 (140 before Generation VI) base power and 90% accuracy which lowers by two levels the user's Special Attack stat after each successful use. Groudon is able to learn it using TM50 in every generation where it is available. 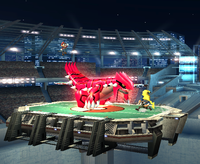 Groudon in the Pokémon Stadium 2 stage. Groudon can be summoned by a Poké Ball: upon appearing it remains stationary, occasionally turning around, and uses Overheat, covering itself with a fiery aura which damages all opponents which come in contact with it. Its size makes it hard to avoid when it first appears. Groudon's effect is very similar to Moltres's one, except Groudon is much larger (approximately twice the size) and lasts longer. However, Groudon's attack is significantly weaker: while touching Moltres results in a OHKO, touching Groudon does rather low damage with low knockback, being incapable of KOing until very high percentages. While avoiding Groudon can be difficult, Groudon is arguably one of, if not the least effective legendary Pokémon in the game, due to its low damage output and inability to KO. A Continent Pokémon. In ancient times, it brought about droughts to save people who had suffered from floods. It is normally found in the profound depths of the earth, where it slumbers in magma. With a mighty roar, it uses Earthquake to shake the ground and mow down enemies. In battle, summons sunlight to bathe the area. It once had an epic battle with Kyogre. Groudon has no gameplay role, only appearing as a trophy. Groudon's trophy is exclusive to Super Smash Bros. for Wii U, where it is part of the Legend of Pokémon Ruby & Pokémon Sapphire Trophy Box. Groudon is called the Continent Pokémon, and that's not just because it lives on them. Legend has it that Groudon actually created the continents. It has a rivalry with Kyogre, said to have created the oceans, and they apparently had an epic battle long ago. Perhaps our world was born from this great battle between land and sea. Groudon is called the Continent Pokémon, and that's not just because it lives on them. Legend has it that Groudon actually created the continents. It has a rivalry with Kyogre, said to have created the oceans, and they apparently had an epic battle long ago. Perhaps it was this battle of land and sea that created the world as we know it. Groudon does not have any gameplay role however Groudon appears as a spirit which can be enhanced once it hits level 99. Enhancing Groudon will turn it into Primal Groudon and set it back to level 1. Groudon's official artwork from Brawl. This page was last edited on April 5, 2019, at 23:13.